The Senate has passed the 2019-2021 Medium Term Expenditure Framework and Fiscal Strategy Paper (MTEF/FSP), even as it prepares to pass the N8. 83 trillion 2019 National Budget possibly next Tuesday. The MTEF/FSP, an annual rolling three-year expenditure planning, sets out the medium-term expenditure priorities and provides the basis for the preparation of the annual national budget. Approval of MTEF/FSP document by the upper legislative chamber yesterday came five months after a request to that effect was forwarded to both chambers by President Muhammadu Buhari. President Buhari had, in making the request last November, provided the parameters upon which the N8.83trillion 2019 budget was based. Adopting the report of its Finance Committee, the upper legislative chamber approved all the critical assumptions and projections proposed by the President in the MTEF/FSP. In passing the document, the lawmakers approved 2.3 mbpd as daily crude oil Production; Oil price benchmark of $60 per barrel; exchange rate of N305/$; GDP growth rate of 3 per cent; inflation growth rate of 9.98 per cent; Others are total federally collectable revenue of N14.89 trillion; Net Oil and Gas Revenue after Costs, Deductions & Derivations amounting to N7.60 trillion; net on oil revenue after costs, deductions and derivation of N2.38trillion; and Federal Government retained revenue of N7. 92 trillion. 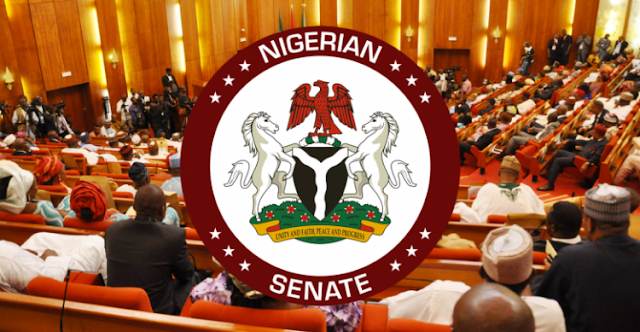 Other Executive proposals for 2019 adopted by the Senate included: proposed expenditure of N8.83 trillion, fiscal deficit of N1.86 trillion, new borrowings N1.65 of trillion, statutory transfers, N492.4 billion; debt service, N2.14 trillion; sinking fund N120 billion, total recurrent (non-debt) N4.72trillion, personnel costs (MDAs) N2.29 trillion, capital expenditure N2.86 trillion, Special Intervention N500 billion among others. Although the chairman of the Senate Finance Committee, John Enoh ( APC Cross River Central ), admitted that crude oil production output stood at 2.0 million barrels as at December 2018, but said that the 2.3million daily target was achievable “due to the continuous efforts of all stakeholders in checkmating the issues of oil facilities vandalism and other vices associated with such regard”. While recommending an exchange rate of N305/$1, the committee encouraged the Central Bank of Nigeria (CBN) “to continue to adopt- ing strategies that will aid the strengthening of the naira and bridging the gap between the official and parallel market rate of the foreign exchange”.